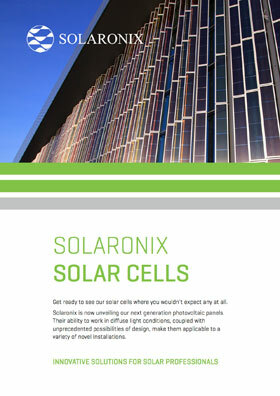 Dye Solar Cell (DSC) technology is at the heart of our development of 3rd generation photovoltaics. The term Dye-Sensitized Solar Cell (DSSC) is equally employed, as well as nc-DSSC (i.e. nano-crystalline). We will see below how the name is derived from the use a of dye and a nano-crystalline structure for light absorption. The latest developments show these two features can be substituted by other compounds, such as perovskites, so the term Hybrid Solar Cells is becoming more appropriate. We will continue to use the term DSC here for simplification. The broader qualifier Thin Film would also apply, since the active layer is in the micron scale, but it isn't specific enough to relate to Hybrid and Dye Solar Cell technologies precisely. Dye Solar Cells can be easily explained with the following paradigm: an electrochemical device composed of an anode and a cathode. These two electrodes are typically made from a specific glass that has a Transparent Conductive Oxide (TCO) coating on one side, a thin layer of fluorine-doped tin oxide (FTO). 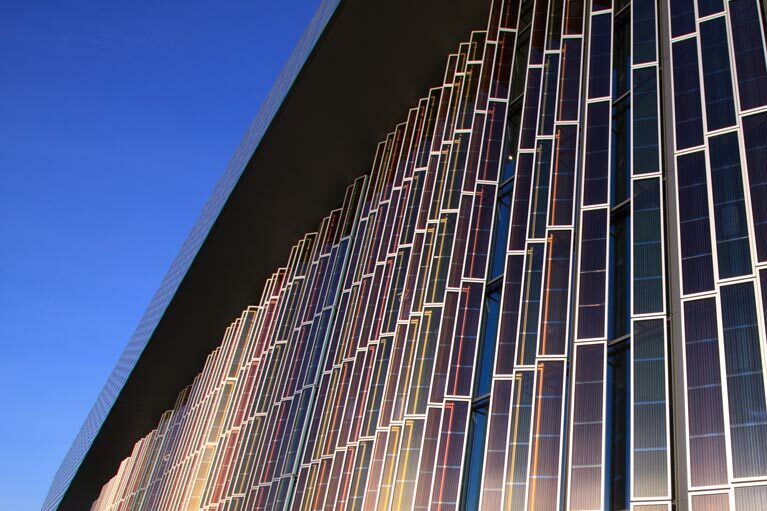 The transparency of the substrate allows sunlight to enter the cell while the conductive surface collects charges. The anode is the negative terminal of the solar cell. It bears a continuous network of sintered titanium dioxide nanoparticles. This porous network offers an actual surface area that is a thousand times greater than the apparent surface area and acts like a “light sponge” where sunlight is "trapped." Bulk titanium dioxide is a white colored semiconductor that is not sensitive to visible light. Nano-crystalline titanium dioxide is made up of titania particles that are less than 50 nm in diameter (0.00000005 m) and appear transparent due to their small size. The titania particles must be sensitized with a monolayer of dye molecules that absorb visible light, hence the name nano-crystalline Dye-sensitized Solar Cells. The positive terminal of the solar cell, the cathode, is often coated with a catalytic material for electron transfer. In most cases this is in the form of trace amounts of platinum. Since a very small quantity of catalyst is needed, the electrode remains transparent, provided the substrate is transparent as well. The space left between the two electrodes is filled with an electrolyte that ensures charge transportation through a redox couple, typically iodide/tri-iodide. Finally, the two electrodes are sealed together with an encapsulant for electrolyte confinement. For stability purpose and manufacturing facilitation, the solvents used at laboratory scale can advantageously be replaced by non-volatile compounds, or even a solid entirely. Photovoltaic devices are able to cause a separation of electrical charges with the help of the energy conveyed by light. The resulting pairs of electrons (-) and “holes” (+) prefer to get together again, or recombine, but this is only possible by completing useful work through an external circuit. From a user standpoint, a Dye Solar Cell is just like a regular battery, except it only appears charged when illuminated. The voltage at its poles is created by the charge separation happening inside the cell, while the electrical current is explained by the natural tendency of charges to recombine. In a Dye Solar Cell, the charge separation happens at the interface of the titanium dioxide and the dye. Remember that this interface is present all over the internal surface of a porous layer. This allows the Dye Solar Cell to form many separated charges for a given area. The nanostructure of the Dye Solar Cell is one of the secrets of its efficacy. The dye molecules have the chemical property to absorb visible light. As they are excited by this phenomenon, the molecules will give up an electron and inject it into the adjacent titanium dioxide. The charge separation occurs when the electron is injected into the titania and the “hole” (electron missing) is left behind on the dye molecule. The anode, which bears the titania dioxide layer, will then appear negatively charged from the accumulation of electrons, whilst the cathode appears positively charges by the opposite accumulation of holes. A tension appears at the extremities of the solar cell, which is equal to the difference of energy levels between the conduction band of titanium dioxide, and the potential of the redox couple in the electrolyte. The separated charges have a natural tendency to recombine, or go to the lowest energy state. This means the oxidized dye molecule must find a new electron as fast as possible. From a kinetic standpoint, the fastest route back to the dye for the electron is to travel through the external circuit. Injected electrons migrate through the titanium dioxide particles and reach the TCO glass of the anode, the negative terminal of the solar cell. When a load is connected, electrons spontaneously move to the positive terminal of the solar cell, the cathode, via the external circuit. This movement of electrons generates an electric current from which power is derived. Thanks to the redox couple present in the electrolyte, electrons can be transported from the cathode's surface to recombine with the "holes" of the oxidized dye molecules, closing the regeneration loop. This light-induced cycle can then restart all over again, as the solar cell produces electricity.